We are so glad so many of you joined us at Honoring Our Past, Shaping Our Future, CJP's tribute to Barry Shrage. We loved learning together in the morning and celebrating together in the evening — check out the pictures! We’re all looking forward to continuing to honor Barry and his legacy with the young adult initiatives that will be accelerated by the Bridge to the Future Fund. Join CJP’s Boston-Haifa Connection on Thursday, May 3, for an evening featuring a film about the evacuation of 8,000 Ethiopian Jews from Sudan. We’ll also hear the personal stories of three visitors from Haifa that reveal the resilience and nuanced culture of Israel’s Ethiopian community. Space is limited, so register today! Guess who turned 70 this year? (Other than Samuel L. Jackson, Olivia Newton-John, and Prince Charles, that is.) Israel! To mark the occasion, CJP and Boston’s Israeli American Council (IAC) are hosting the Celebrate Israel Festival on Sunday, May 6, a three-floor experience at Flynn Cruiseport for the whole family with activities, performances, and markets. Get your tickets now, or, if you want to help out, sign up to volunteer. Let’s be women who dare to change the world. Join CJP’s Women’s Philanthropy for our Annual Pomegranate Society & Friends Event on Monday, May 7. We’re thrilled to have New York Times bestselling author Jennifer Weiner as our keynote speaker — you may know her books In Her Shoes and Hungry Heart. Online registration has closed, but contact Becca to see if there will be room for walk-ins! Join Women’s Philanthropy for their Metrowest Spring Event: CJP’s Poverty Simulation on Tuesday, May 22. You’ll assume the role of a person from one of 20 different families facing financial distress and work together to reach stability, and you’ll also learn more about how CJP and our partner agencies are working together to combat poverty in our community. Join us for this meaningful evening! Yom Sport is coming up on Sunday, June 3! CJP and Jewish Big Brothers Big Sisters are looking for volunteers for our annual day of fun for athletes of all abilities. Come make new friends, gain a new perspective, and help everyone involved have a blast. Join YJP on Thursday, May 3 for a celebration of Lag B’Omer (traditionally the one day of celebration in the solemn time between Pesach and Shavuot). With an outdoor evening of BBQ, a bonfire, and jazz, there’ll be plenty to drink and eat and plenty of new friends to meet! Chill with TRIBE1187 from Temple Ohabei Shalom with a yoga class and meaningful meditation based on Jewish values and blessings on Sunday, May 6. Have to miss it? There’s one every month! Online ticket sales end 24 hours before class begins, so get yours today. Discover why so much Jewish food is fermented at The Vilna Shul on Wednesday, May 9! You’ll also learn how to pickle anything and everything and go home with custom jars of pickles and kraut. Delicious! Yom Yerushalayim is on Sunday, May 13 — want to learn more about the incredible city of Jerusalem? Join New England Yachad for a celebration featuring the Shinshinim, our young Israeli ambassadors, and Young Israel of Sharon’s Bnot Sherut. This free event is open to all teens and young adults, so sign up now. Ganei Beantown is presenting their first Metrowest Young Professionals Seasonal Dinner on Sunday, May 13! Make connections with good folks over good food. Your cost for the evening is reduced if you bring a vegetarian dish to share, so get cooking and reserve your spot! New England Friends of the Israeli Defense Forces (IDF) is hosting their first-ever springtime celebration on Thursday, May 24 to support the soldiers. With music, drinks, and a silent auction, it’ll be a night to remember. Get your tickets and support the cause! 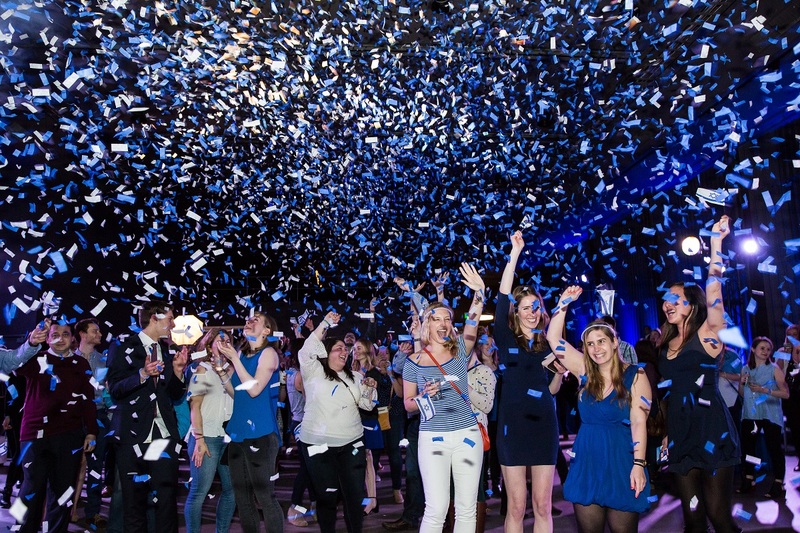 Blue & White Night, our annual celebration of Israeli Independence Day, was on April 19, and we had an amazing time. Check out the pictures and start counting down the days until it comes back next year! May 4 | 7:29 p.m.
May 11 | 7:37 p.m.
May 18 | 7:44 p.m.
May 25 | 7:51 p.m.